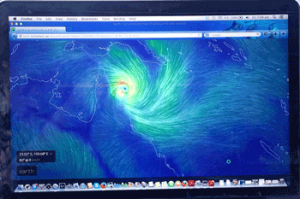 I arrived in Port Moresby on 1st April but the Cyclone forming in the Solomon Sea was no joke. Captain Craig de Wit had invited me for an adventure into the Northern Coral Sea. We were to dive some of my favourite wild sites at Eastern Fields (PNG), nip into Australian Waters (Craig has permission to do so) to dive (but not fish at) Ashmore Reef and Boot Reefs, then back to PNG waters at Portlock Reef and finish up back in Port Moresby. Checking the moon phases we realised that if our group were to make Port Moresby’s incredible Flashlight fish dive we would have to do it immediately in order to get the moonless evening essential for the fish to appear. They live in the chain locker and elsewhere on the wreck of the Pacific Gas – a steel ship that I sank with friends in 1986, and which has developed into an excellent dive site. So just after sunset we geared up and when dark, with no lights, made a hand over hand descent down a setline to the bow where we hung on and waited. Soon a glow appeared at the hatch then thousands of fish, pulsing the light organs on their cheeks, flashed their way out of the locker and flowed like a river of light over the rest of the wreck. It is a totally space age, and unique, experience. Cyclone Ita was now near Milne Bay and gaining strength. We had some decisions to make. Chances were that ITA would move south and that Eastern Fields, south west of Port Moresby, would not be affected, but we would be foolish to assume anything. Craig believes, as I do, that the answer to good seamanship is to avoid those circumstances that call for it! Fortunately Craig’s boat, the recently refitted MV Golden Dawn, can download excellent weather charts both from Australia’s BOM and with a World service subscription. Both confirmed the position of Ita and Craig decided to cruise to Eastern Fields, and then reassess the situation. So next day we set off early and by mid-afternoon were diving in fantastically clear water in calm seas with a slight swell. One thing was very obvious – the corals had just spawned and great rafts of gametes drifted on the surface. The New moon was on 31st March. In previous years I have witnessed spawning a few nights after the full moon in November, and although I am aware of spawning around April, this was my first time to see the results after a new moon. We dived the superb “Carl’s Ultimate” the next day then, since Ita was not moving very much (but giving Milne Bay a pounding), we pushed on to our southernmost objective – Ashmore Reef. 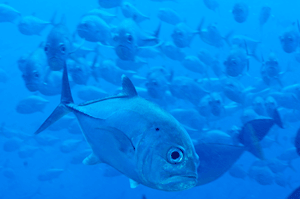 Ashmore Reef is very seldom dived or fished and has a very healthy population of wild sharks. To get us in the mood Craig took us in the dive tender Miss Piggy to Picasso Pass on the eastern side of the atoll. Miss Piggy is an insult to pigs and probably the most ugly dive tender in the Pacific – but to my great surprise, she works!! Swells, presumably from the cyclone, were crashing on the outside but Craig took the dive tender through the passage to the pass entrance that was partly sheltered. There was no wind and a slight incoming current. The idea was to spend some time there then gradually swim back with the current through the pass towards the anchored boat, keeping our left shoulders to the slope, getting a pick up on the way if needed. It was a bit lumpy in the pass, but again there was superbly clear visibility and sharks were abundant. Some bottle rubbing from Craig soon had melee of Grey Reef and Silvertips making exciting passes. One Silvertip came fast out of nowhere and Craig had to push it off through a 360 degree spin before the shark took off. For those that are not familiar with “bottle rubbing” Craig used an empty water bottle, filled it with sea water and carried it down to the site. Then he removed the water by blowing air into the bottle and screwed the cap back on. By twisting the bottle for a few seconds he produced noisy vibrations in the water that sharks took to be frenzied fish – their favourite food – and raced in to investigate. Be warned, they can come very fast, so only twist for a few seconds at a time. And have a good look round before you start. On a later dive at a special seamount near Portlock Reef, Craig brought up a very nice Bull Shark along with the usual Grey Reefs, Silvertips and White tips. When Craig stopped rubbing, the Bull Shark swam towards me, attracted by my succulent thighs, and because I had separated from the group. You often get more action if you are by yourself. He made a wonderful close pass though I had my fish lens on my camera and not the wide angle I needed for this impressive creature. Anyway we had a splendid time with the sharks at Picasso Pass and I swam further down the pass, keeping my left shoulder to the slope. After a while I was a bit concerned that the others had not caught up. I had found a hot spot with thousands of Jacks and Barracuda and other fish milling around. Truly spectacular! But the others missed it all. I found out later that they had taken a short cut back to the boat. I was surprised no one else was around, so, before I entirely ran out of nitrox (I also had a full pony bottle) I decided to do my stop in the shallows then surface. Whoops! When I surfaced I could not see anything because the swells had picked up and the seas were confused. I slowly circled and looked out as I reached the top of a swell. After a couple of quarter turns I spotted the boat and Miss Piggy – a long way away. I could have gone down again and made my way at least partly back but since I thought they might be looking for me I decided to inflate my safety sausage then return on the surface. I can swim all day with fins on. The idea was to inflate my BC, turn on my back, use a cloud beyond my fins for approximate direction, and swim to the boat with my orange sausage flying bravely above the waves. Great plan except my new (but alas untested, silly me) sausage had a faulty seal in the far end and leaked every breath I blew in. I wrapped the erectile dysfunctional sausage around my shoulders and swam – still on my back. I’d NEVER try a snorkel in these circumstances and do not advise you to either. 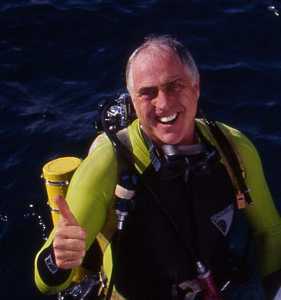 It is too much effort with the tank pushing your lungs underwater, and heaving waves continually flooding the snorkel. I was not worried yet – I had a really good trick to try – learn it! As I swam back to the boat after every few kicks I cupped a handful of ocean with my right hand and tossed it in the air. Yes I pretended to be a whale! Throwing water in the air really works and within a couple of minutes Engineer Ben spotted me and that was the end of the story. Shame was I returned with far too much Nitrox still in my tank. Good to remember that the useful buddy is the one looking out for you on the boat! Ita had started to move west, but because Craig had planned so well we were now heading north out of the way. We still had calm weather and the swells were no worse that you would get in the SE trade winds. But the wonderful diving! Oh My! 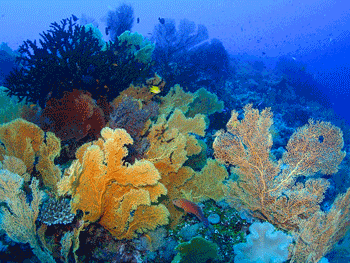 There were boundless fabulous healthy reefs including many with hectares of regenerating corals. Soft corals and sea fans bloomed all over the place. There were huge schools of fish, Tawny sharks and turtles, Giant Queensland grouper, a beautiful “Comet” fish, two Rhinopias scorpionfish, many Dogtooth Tuna, Giant clams and tiny Dottybacks hiding in ledges in the coral wall – including a couple of new ones I’m saving for an eventual second edition of Bob Halstead’s Coral Sea Fish Guide. As Ita hit Cook Town we were safely in the lagoon at Portlock Reef. The swells quickly died down and winds were no more than 15-20 knots at their fiercest. We were prepared to run north into the Fly River delta if the cyclone swang our way, but it was never even close. We steamed back to Eastern Fields where I made the most incredible drift wall dive I’ve ever made. It went on and on ranging from a vertical wall to a slope decorated with zillions of gorgonians. Extraordinary. Craig called it “Miny mo” or some silly name so I decided to modestly name it “Big Bob’s Drift” but that was vetoed as inappropriate and they are looking out for a spot less youthful and vibrant and more decrepit to suit me. Cheeky lot. Deborah Kolb was teaching crew Stephen and Benji the fine art of on-board gourmet cooking, and joined us on many dives – I first dived with Deborah in the 1980s from Telita when she managed to entice a whale shark to swim with us. It was good to dive with her again, but where was the whale shark Deb? Golden Dawn performed flawlessly, and I returned to Cairns happy with the knowledge that the northern Coral Sea reefs are in excellent condition and were completely unaffected by Cyclone Ita. No doubt some of the reefs directly in its path have been broken up – but recovery will be swift. I returned to Cairns to find that my apartment at Yorkeys Knob had not even had a power cut or a fallen tree, and the only new job I had was to buy a decent Safety Sausage – and test it! See his Coral Sea Fish Guide. Bob was smart to use his non-inflating safety sausage as a “stole”. The bright colors of these things at least help attract attention even if they won’t inflate. A hint to anyone else in this position: if the leak is at the far end of a sausage, tie it off if you can. The sausage will deflate but not as fast. If you have a very long sausage (some are 6-8 feet long! ), you might tie more than once to create a floating triangle–I’ve had to do that, it worked but I wasn’t in such high seas as Bob. A lot of people won’t dive in quarries, lakes, etc. because it is boring. But if you are a divemaster or belong to a program that requires a dive every few months, no matter where, this is a great opportunity to test everything: your gear, rescue skills, free ascents, etc.